Breathtaking fully renovated three bedroom, three bath east corner unit with panoramic views of the Gulf of Mexico and pristine sandy beaches. Sunrise Beach Unit 901 is truly a stunning unit with new flooring, new AC (2018), custom lighting and fans, updated appliances including washer and dryer, fresh paint and incredible furniture on interior and balcony. The unit is fully furnished and decorated in a bright beach contemporary style, making this an ideal turn-key rental investment! This also includes an onsite storage unit for all of your beach gear. Large windows throughout the unit provide lots of natural light and bring the outside in. Being a corner unit, you can enjoy a spacious wraparound balcony – prime spot to relax, entertain, or dine. The living area and bedrooms feature brand new high end vinyl flooring. The open floor plan is ideal for entertaining. The kitchen is beautifully designed to be the heart of your gatherings, with a large wraparound breakfast bar island and newly updated stainless steel appliances. Recessed and custom light fixtures accent the space. The dining area sits off from the kitchen and offers Gulf views. The living area is welcoming with fantastic furniture, flat screen TV and the wraparound glass offers Gulf views from nearly every angle. Beach maintenance at Sunrise Beach Unit 901 is easy with the updated flooring and tile that extends throughout the kitchen, hallways and bathrooms. The Gulf front master bedroom has direct access to the private wraparound balcony, two closets and an en-suite bathroom. The spacious master bath amenities include a garden tub, walk-in shower, double vanity, and custom light fixtures. One of the additional bedrooms has Gulf views and an en-suite bathroom. The third bedroom is furnished with bunk beds to maximize sleeping accommodations. Sunrise Beach Unit 901 has an extensive list of recent renovations and is sure to impress! You’ll enjoy plenty of storage with an owners closet, separate storage unit, pantry and large laundry room. The unique design of this building means you will enjoy a 15th floor elevation, as the parking covered parking garage occupies the first four floors of the building. Sunrise Beach has luxurious amenities including: 2 elevated Gulf front pools, one heated seasonally, 2 spas, large sun deck, spray park, owners lounge with full kitchen, Gulf front exercise room, theatre, plenty of underground parking, Gulf front gas grills, 330 ft. of beautiful white sandy beachfront. Seasonal beach service renting beach chairs and umbrellas and a variety of watersports including jet skis, catamarans, paddle boards, banana boat rides and parasailing! Sunrise Beach is a deluxe 25-story Gulf front complex with 275 units. It is located just one mile east of Pier Park and only a short drive to Frank Brown Recreation Center and Gulf World marine park. Paradise awaits at Sunrise Beach Unit 901! 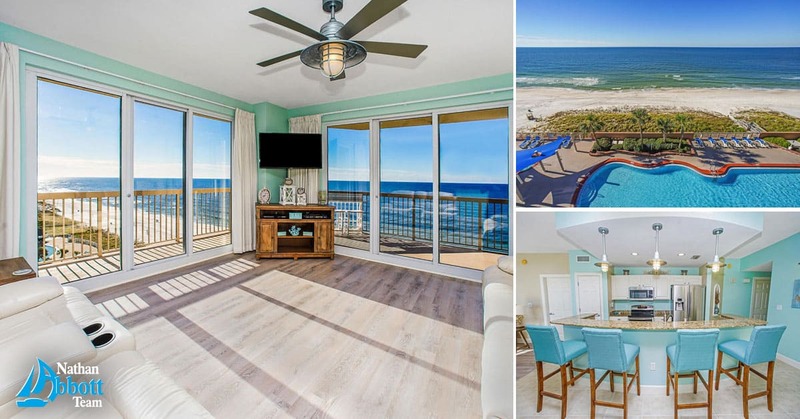 Paradise awaits at Sunrise Beach Unit 901!